Frederick Michael Oxford was born in Hadleigh in 1893. He was the son of Alfred and Catherine Oxford and in 1901 the family lived at the Brick Kiln at Red Hill, Hadleigh. 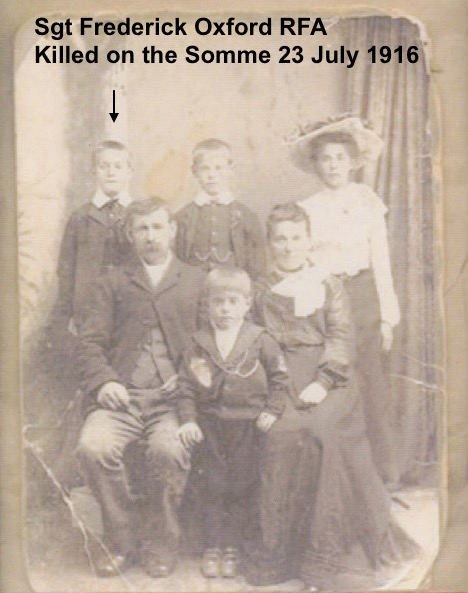 Also living at home at that time was Frederick’s other siblings; Frank (17), Alfred (15), Ernest (12), Bertha (10), Arthur (6) and Stanley (1). 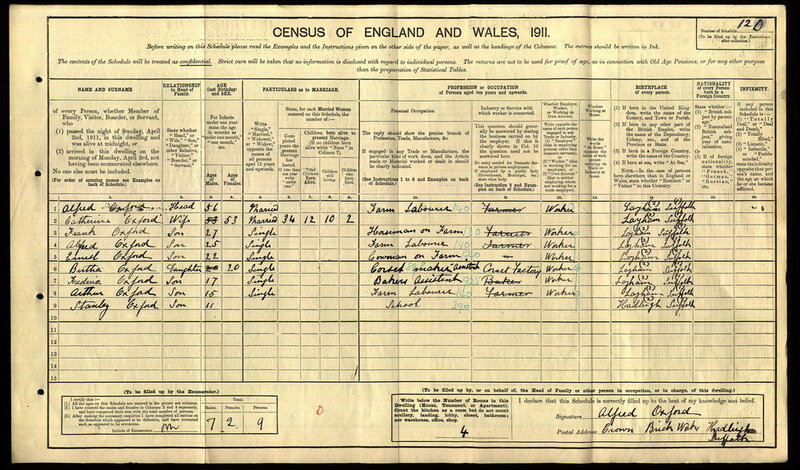 By the 1911 census, the family was still living at the same place, now called the Crown Brick Works. Frederick had enlisted enlisted with the Royal Field Artillery before the war and in August 1914 was sent to France with the BEF. 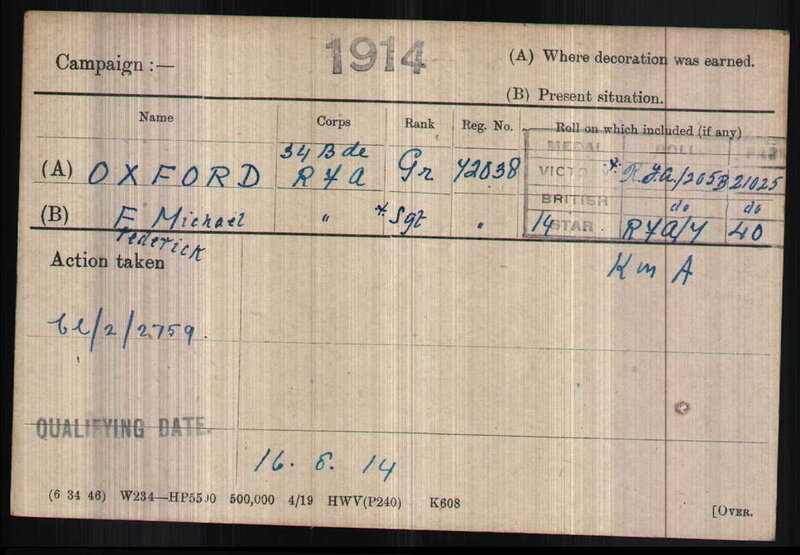 Frederick Michael Oxford was one of nine sons, eight who served during the Great War. 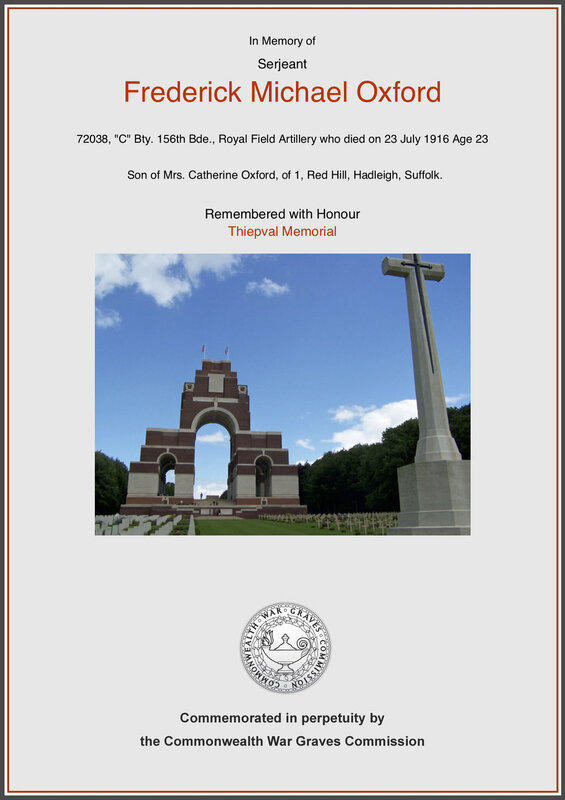 His youngest brother, Stanley Charles Oxford was conscripted and joined the colours in February 1918 and was allocated to the 1203rd Battery of the Royal Field Artillery. From 1918-19 this unit formed part of the North Russia Intervention, tasked with ensuring some stability in the east following the Russian Revolutions and the collapse of the Eastern Front. While in Russia, Stanley accidentally drowned. Stanley’s story is told elsewhere on this website. The whereabouts of Frederick’s actual medals is unknown, but he qualified for the above three medals, which include the 1914 Star. Frederick arrived in France in August 1914 with the 34 Bde RFA. These were a regular army formation. At some point thereafter he was transferred to the 156 Bde RFA who had been created as a New Army formation and were placed under command of the 33rd Division. 156 Bde RFA was made up of 4 batteries, A, B, C and D. Each battery was armed with four 18 pounder Howitzers. The 33rd Division was largely comprised of locally raised units known as “Pals”, with units raised by the public schools, sportsmen and other groupings. 33rd Division troops were predominantly from the south of England. In November 1915 the Division received a warning order to prepare to sail for France. The Division then remained on the Western Front and one of their first actions was during the Battle of the Somme. Initially taking part in the Battle of Albert on 1 July 1916 and then a couple of weeks late at the Battle of Bazentin. It was during the Battle of Bazentin that Frederick was servicing his gun when he was killed in action. It is thought that he was shot in the heart by an enemy sniper. 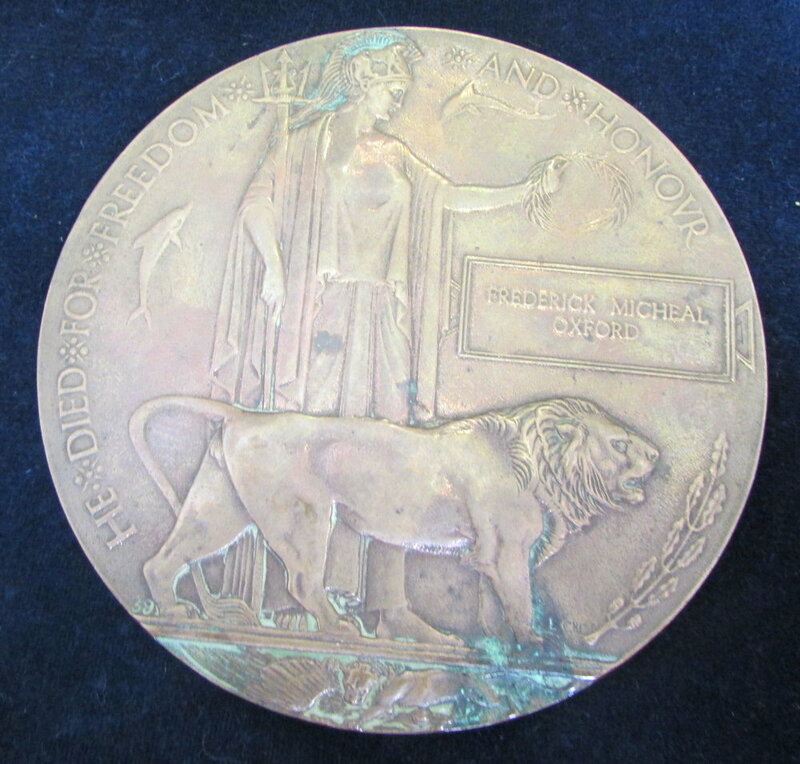 Frederick Michael Oxford’s Commemorative Memorial. Frederick and Stanley Oxford are both remembered on the Hadleigh Great War Memorial. 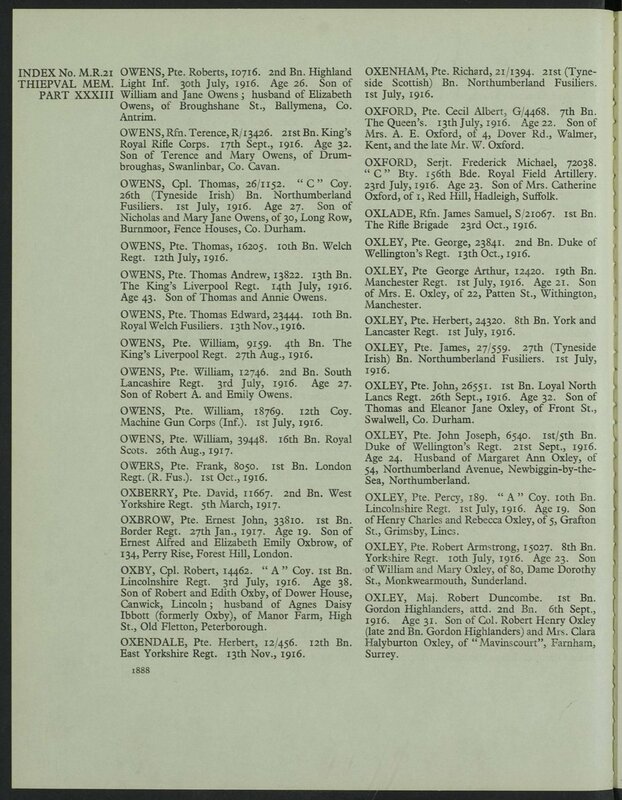 We hope that this page has been able to tell the story of Serjeant Frederick Michael Oxford. If you know of any information which might help to add to the story then please get in touch.